La-Z-Boy Georgina 3 Seater Power Recliner & 2 Seater Power Recliner. 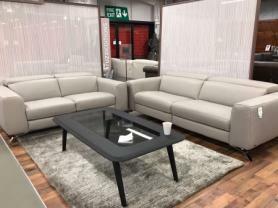 This fully upholstered in full beautiful top quality Mezzo Squirrel Grey genuine leather is the perfect addition to any modern home living space..
Georgina combines some of the most popular La-Z-Boy UK style elements to create a brand new contemporary range. Comfort is at the heart of the Georgina range, with its sumptuous pillow-like headrests, deep-fill padded back and seats, fully padded armrests, all waiting to welcome you into a world of relaxation. The best selling model in the best selling colour available on 4 week priority order. Approximate Measurements: 3 Seater 202cm wide x 97cm deep x 107cm high, 2 Seater 145cm wide x 97cm deep x 107cm high. Another fantastic bargain from the official La-Z-Boy factory clearance outlet.